Building work starts on a £6.5m community stadium in Dartford on Monday, to bring the town's football club home next year. 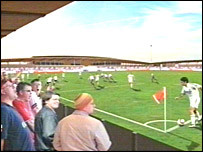 Dartford Football Club lost its old ground at Watling Street 13 years ago, but now both the club and the council are looking forward to its next move. Club co-chairman Bill Archer said it was the "start of a whole new era". 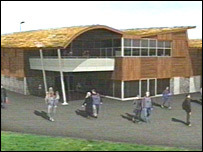 And councillor Jeremy Kite said the club could plan its future properly and the town could expect "a huge boost". The council's deputy leader said: "We have come a long way since the leader announced our plans for a new football stadium back in April 2004 and now we can stop the planning and start the building. "The club can now start to plan properly for its future in the town, and the town can look forward to being the home of the Darts once again." Mr Archer added: "There has been so much talk about the stadium being built and we'll now be able to see it actually happening." The Princes Park complex, funded by Dartford council, will have a stadium capable of holding 5,000 fans, 1,000 of them seated, with training facilities for Dartford Football Club and other teams. It will also include an artificial pitch for community use, a bar and function rooms and a public plaza and gardens. The council has said the stadium would be one of the most ecologically sound ever built, with timber cladding, its own water recycling system and a grassed roof. The club has shared the ground of Gravesend and Northfleet for the past three years having previously shared with Erith and Belvedere and Purfleet. It hopes to have the stadium open by August 2006.